Innovative Building Solutions provides a variety of solutions to create a safe environment. We offer retrofitting to new and existing structures. 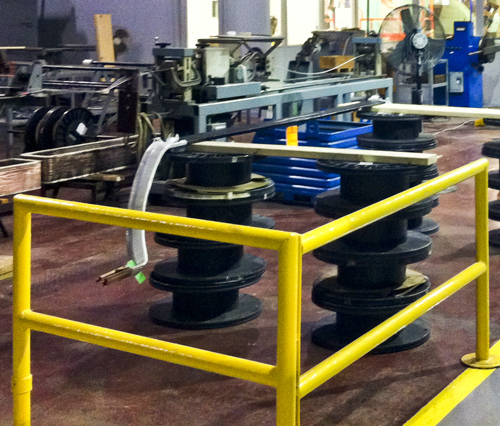 Our manufacturers have mounting gear adaptable to a variety of surfaces. Hardware and installation can be provided to complete the job. Or arrange for materials to be shipped directly. Innovative Building Solutions economical handrails and safety gates are easily installed. Professionally engineered to meet all building codes including Uniform and Point load requirements. Innovative Building Solutions safety gates help you safely move materials with convenient access to mezzanines and other elevated storage areas. Innovative Building Solutions constructs an all welded, modular, stackable system with advantages unparalleled in the industry. We also create custom fence partitions to fit your specifications. With a wide variety of styles and configurations, Innovative Building Solutions is sure to have your solution. Innovative Building Solutions constructs professionally engineered products to provide maximum protection for people, machinery, building walls, shelving, conveyors, racks, finished product, raw material supplies, loading docks and more. Consult an Innovative Building Solutions professional to decide which barrier is the safest solution for your environment. Innovative Building Solutions bollards are extremely durable, have a structural steel design with easy, bolt-to-floor installation. Choose from 14 standard colors protected by a durable, and attractive powder coat finish. Customized colors and finishes available to meet requirements.